LingUU 3.1 is out now! 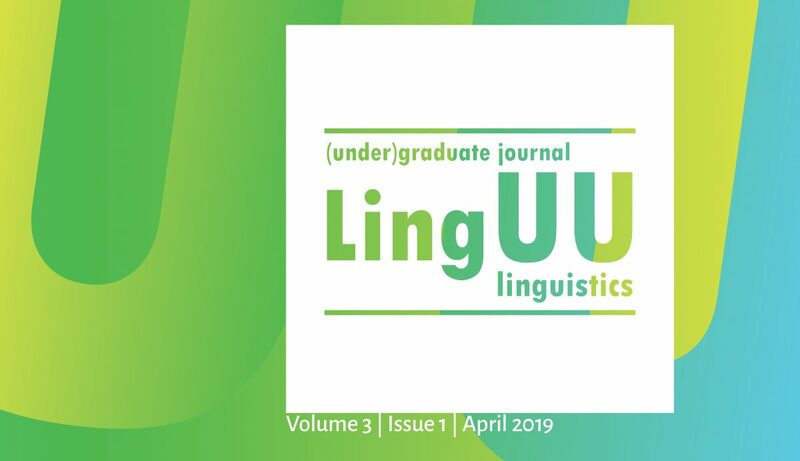 The fourth issue of LingUU Journal features articles on various linguistic topics, written by students from different BA and MA programmes. Download the entire issue, browse through the contents, or order a paper copy (while supplies last). Thanks to our authors, reviewers and advisory board, and special thanks to our founding mothers: Sophie Slaats and Fieneke Jochemsen! Anouk Scheffer (RMA Linguistics) proposes a study on the effect of stress cues on mapping meaning to newly segmented words. This study focuses on monolingual and bilingual infants of 17 months old, learning both an iambic and trochaic language. Anouk suggests a way in which both word segmentation and the ability to map meaning to words can be examined. Héloïse Pierret (RMA Linguistics) discusses the role of prosocial deception (‘white lies’) in maintaining a good communicative project. She argues that prosocial deception plays a role in manipulating and protecting the emotions of others. To visualize the role of deception in communication, Héloïse adapted the Affective Language Comprehension (ALC) model by Van Berkum (2018). She argues that a circular categorization should be used to classify deception types. Japanese has emotions embedded at the core of its structure, in the shape of morphological elements. Damien Fleur’s (RMA Linguistics) paper reviews the literature on two such elements, namely the sentence-final particles ne and no. Through the prism of the Japanese society and with examples from Van Berkum’s ALC model (2018), this review investigates how these interactional particles ultimately perform in emotional communication. Marjolein Talsma (RMA Linguistics) reports enthusiastically on her internship on the valency of weather verbs at her home-base, Utrecht University. A little further away from home, Anique Schüller (RMA Linguistics) went on exchange to the Chinese University of Hong Kong to study cross-language activation in deaf bimodal bilinguals. Myrthe van der Veen (BA Linguistics) reviews Paulien Cornelisse’s Taal voor de leuk. This book does not diverge from Cornelisse’s previous books with collections of columns on linguistic and often amusing situations. Cornelisse’s lively and ironic tone is praised, as well as her sharp observations. Roos Kerrebijn (BA Nederlandse Taal en Cultuur) writes about Het vermogen te verlangen by Liesbeth Koenen, which is a collection of interviews with renowned linguists about their work. Roos finds the book accessible and interesting for both linguists and a wider audience.